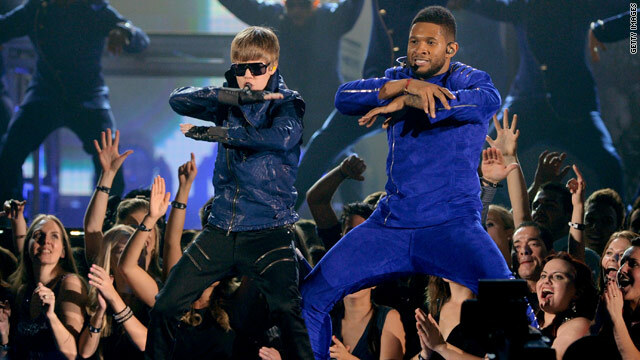 Justin Bieber, left, and Usher peform at the 53rd annual Grammy Awards. Los Angeles (CNN) -- Millions of television screens reverted to black and white for a few minutes Sunday night as the 53rd annual Grammy Awards turned off the color for Bruno Mars. It was a section of the show that emphasized the connections current popular music has to the past, on a night with several music legends are teamed with new stars, including Barbra Streisand, Mick Jagger and Bob Dylan. Mars sang his hit "Grenade," a performance that echoed back to the 1950s and Sam Cooke, or the 1960s and Otis Redding. Janelle Monae followed with a futuristic soul performance of her song "Cold War," which brought the Staples Center crowd to their feet for a long standing ovation. Rihanna made a triumphant return to the Grammys, two years after she canceled her performance hours after she was beaten by then-boyfriend Chris Brown. Nicki Minaj: Worst or best dressed? Rihanna teamed with rapper Eminem to perform their "Love the Way You Lie," a record of the year contender. As Rihanna sang the lyric "I need a doctor," they were joined by Dr. Dre. It was Dre's first live television performance in over a decade. Eminen was later handed a Grammy for best rap album for "Recovery," the best selling CD of 2010. Rihanna, who appeared to have recovered from her bout with the flu, also delivered a steamy rendition of her hit "What's My Name" with best new artist nominee Drake. Lady Antebellum took home five Grammys, including for song of the year, record of the year and best country album for "Need You Now." The group also was given two Grammys in the pre-telecast show. Jazz bassist and singer Esperanza Spalding beat out Drake and Justin Bieber to win the best new artist award. The show opened with a "get-well card" to Queen of Soul Aretha Franklin, who is recovering from an undisclosed illness. Yolanda Adams, Christina Aguilera, Jennifer Hudson, Martina McBride and best new artist nominee Florence Welch sang a soulful montage of Franklin's hits, including "A Natural Woman," "Ain't No Way," "Knock On Your Door," "Think," "Baby I Love You" and "Respect." Franklin did not attend, but instead a video message was played. "I especially want to thank all of you who took the time to send me get well cards and flowers, beautiful flowers, and most importantly your prayers during my time of hospitalization," Franklin said. "I wish I could have been with you tonight," Franklin said. "But next year, OK?" The star power from the past included Barbra Streisand, who sang her 1976 Grammy and Oscar winning song, "Evergreen." It was the theme song for "A Star Is Born," the film in which she starred with Kris Kristofferson, who introduced Streisand. Mick Jagger paid tribute to songwriter Solomon Burke, who died last October, by singing Burke's "Everybody Needs Somebody to Love." The Rolling Stones covered the song on a 1965 album. Bob Dylan sang and played his harmonica with best new artist nominee Mumford and Sons and rising roots rockers, the Avett Brothers, in a salute to the comeback of acoustic music. A musical tribute to country legend Dolly Parton featured Nora Jones, Keith Urban and Jon Mayer singing her song "Jolene." Lady Gaga popped out of a giant egg on stage at the start of her performance of "Born This Way," a song with a message about gay and lesbian rights. Gaga, who wore a raw meat dress on another red carpet last year, arrived inside the egg for the Grammys. Gaga was "incubating," her creative director Lauri Ann Gibson said. "It was necessary to incubate her for a certain time, because tonight she is actually birthing a new race," Gibson said. "A new race that doesn't have the ability to judge or hate in their DNA, so she is incubating right now so she goes through that process." Gaga, whose "Bad Romance" won her two Grammys during the pre-telecast show, was given the best pop vocal album Grammy during the telecast for "The Fame Monster." British alternative rock band Muse won the best rock album grammy for "The Resistance." Miranda Lambert won her first Grammy, taking home the best female country vocal award for her song "The House That Built Me." "Thank you, and I love country music," Lambert said. Train won the first Grammy handed out on the telecast. It was for best pop duo or group performance with vocals. A mini-tribute to the four-year career of the 16-year-old pop sensation included video of an even younger Bieber auditioning for his eventual mentor, Usher. Bieber sang a montage of three songs with Usher and actor Jaden Smith, the 12-year-old son of actors Will Smith and Jada Pinkett Smith. Cee Lo revamped his hit "F**k You" into "Forget You" so he could perform the record of the year contender on the broadcast. He was accompanied by Jim Henson's Muppets and Gwyneth Paltrow. It was a colorful performance, strikingly reminiscent of Elton John's guest appearance on the Muppets. With 98 of the 109 awards presented pre-telecast, producers had plenty of time for entertainment during the 3 1/2-hour live show on CBS. Jeff Beck, John Legend and Jay-Z each won three Grammys in the pre-telecast presentations, while BeBe & CeCe Winans, the "Crazy Heart" soundtrack and Usher gained two trophies. Jazz legend Herbie Hancock added two Grammys to his extensive collection, one for improvised jazz solo and one for best pop collaboration with vocals. With 14 of the trophies on his shelf, Hancock told CNN winning them never gets old.